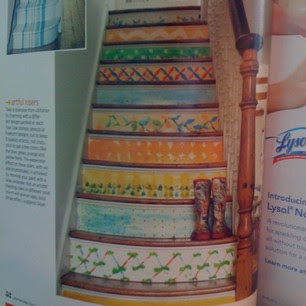 I saw this painted stair riser idea in the April issue of Woman's Day Magazine. isn't it great? I would love to try this someday. For another painted stair idea click here. wow! I love those stairs!! I would love to do that here.. maybe someday!! have a happy day Jeanne! I am so intrigued with these painted risers. I like the ones that spell things, too. Alas I have three bends in my stairs! I thought you had painted this, Jeanne, and I was just amazed! Well, I still am amazed. And, frankly, I would have what you do in my house before this!